As the series closes, I'd like to feature my favorite HIMYM episodes starring the great city of New York. 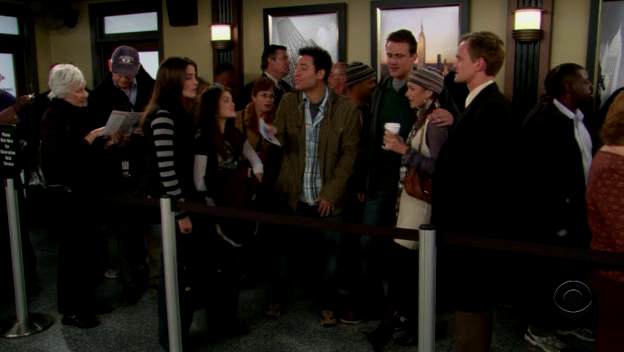 "First Time in New York"
In this episode, Robin's younger sister comes to visit her and the gang goes to the Empire State Building, a place where Ted says everyone should go. Ted starts announcing his "Empire State Building Fun Facts" while the friends are waiting in line, including that when construction began in the 1930s, the framework rose at a rate of 4.5 stories a week. My favorite line in this episode is one of Ted's, when Robin's sister asks if he has another "Empire State Building Fun Fact" for her: "Psh...I wouldn't bore you with the 700,000,000 man hours it took to build this 102-story testament to human will." 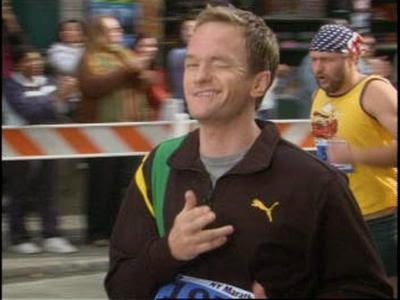 Barney claims that you don't need to actually train for the New York City Marathon and decides just one day before the race to run in an injured Marshall's place. The episode features the group cheering for the runners on 1st Avenue, just as I've done in the past. Marshall tells Barney that all marathon runners get to ride the subway for free that day and Barney decides to "slum it" and try out the 6 train. Little does he realize his legs aren't going to work so well after that 26.2 mile run. Hilarity ensues when he can't get up from his seat - even for a pregnant woman, a senior citizen, and a boy with crutches. It's also in this episode where Ted misses a job opportunity in Chicago, but then states at the end that his destiny was to stay in New York. Barney and Ted pretend to be tourists from out-of-town in order to pick up women. They ask two ladies which street the Statue of Liberty is on and are informed that it's actually on its own island. Barney and Ted say it would be so great to be shown around by real New Yorkers and they agree to meet the women the following night. Future Ted's voiceover says, "Kids, when you visit New York, there's countless fun things to see and do, and yet, Colleen and Lindsay took us to Tater-Skinz," a fake restaurant chain that actually sounds pretty awesome to me. 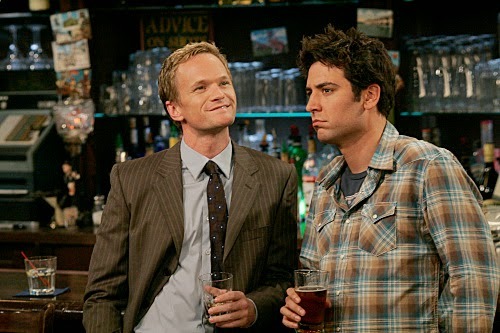 Current Ted says to Barney, "Somehow, we managed to find the two lamest New Yorkers of all time." Later on in the episode, it's revealed that the ladies are not from New York, but are actually from New Jersey, which Ted becomes livid about - "This is the greatest city in the world and you have to earn the right to call yourself a New Yorker!" "The Best Burger in New York"
Marshall starts talking about how no burger will ever taste as good as the burger he had when he first moved to New York. As this was before he knew how to find his way around, he never came across this burger again. A similar situation happened to me when I walked into Marie's Crisis this summer and realized I had been several years before. I'd wanted to remember it so I could return but just forgot over time. 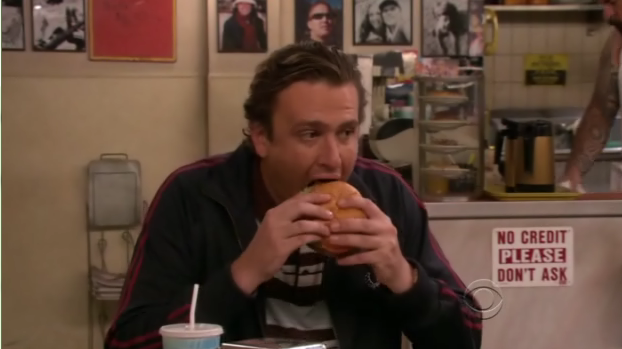 Another bar patron on the show suggests that Marshall may be talking about the burger at Corner Bistro, a place that does exist in real life and does have a damn good burger. Marshall angrily says, "Oh here's another tip, the best coffee in New York is at Starbucks!" The crew (along with Regis Philbin) sets out on a mission to find this burger and eventually succeed after traveling around Manhattan for hours. My favorite line in this episode is one of Marshall's from eight years prior, "I dunno, does stuff stay open in New York past 9:30?" This episode is definitely a favorite as the group lists out how to tell when you're a real New Yorker. You have to have (1) Seen Woody Allen (2) Stolen a cab from someone who needs it more than you do (3) Cried on the subway and not cared a bit (4) Killed a live cockroach with your bare hands. I've only done two of these, you can probably guess which ones. The friends get into a discussion about what's faster, the subway, the bus, a cab, or running (please note Citibike was not a thing yet) and race each other downtown, each running into Maury Povich along the way. Best line in this episode is Ted's - "If you can't spot the crazy person on the bus, it's you." Thank you, HIMYM, for a wonderful run, and for featuring my favorite city of all time in so many legen...wait for it...dary episodes.